R’ Moshe ben Nahman (1194-1270), also known as the Ramban or Nahmanides, was born in Girona, Catalonia in present day Spain. This city is where he spent most of his life, including where he wrote his commentary on the entire Humash. Following his arrival in Eretz Yisrael in 1267 he edited his commentary. After observing the geography of Eretz Yisrael, he realized that some of the assumptions made in his commentary were incorrect. He subsequently edited his commentary with hundreds of new passages in the last three years of his life. It should be noted that, in order to not cause confusion to the scribes who would copy his commentary, the Ramban would always add the changes to the existing text and would almost never delete anything. Most editions of the Ramban’s commentaries are close to the updated edition, and they have minimal indication of whether a particular passage was added to the original by Ramban at a later stage. 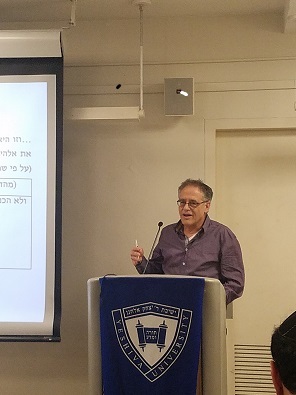 Dr. Yosef Ofer (and his colleague Dr. Jonathan Jacobs) were able to find them all using three methods of identification: explicit statement of the Ramban, ‘update lists’ sent from Eretz Yisrael, and finally, a mutual comparison of the manuscripts of Ramban’s commentary, which represent the two phases of its creation. Dr. Ofer focused on the following examples: Hevron, kever Rachel, and the shekel. Commenting on Genesis 42:9, where Yosef has reached the apex of his career as a servant to Pharaoh and is finally confronted by his brothers, the Ramban asks why he did not inform his father of his whereabouts. He notes that the journey from Egypt to Hevron was a mere six days. This passage was added following his arrival in Eretz Yisrael, clearly reflecting his newfound knowledge of the length of travel from these two points. Similarly, in Numbers 13:2, when Moshe sends the spies, the Ramban initially assumes that the recently-freed Israelites were unfamiliar with the goodness of Eretz Yisrael, and the spies’ mission was to inspire confidence in the people of the land’s greatness. However, the Ramban revises his commentary to say that their mission was to find a good route to enter the land, reflecting his realization of the short distance from Egypt to Hevron (seven days in this passage, a minor discrepancy from Genesis 42:9). In the case of kever Rachel, Genesis 35:16, regarding Rachel’s death, the verse says she died kivrat ha’aretz far from Ephrata (=Bethlehem). Various opinions differ as to what that phrase means. The Radaq thought that it referred to two- or three- hour journey on foot (about 10 miles). Ramban adopted his commentary, but having discovered that her tomb is one mil from Bethlehem, he revised his commentary. . [Rav Kimhi suggests that the letter kaf is not part of the root of the word kivrat. Its root is b.r.h. which means to eat, found in EIcha 4:10 and Samuel II 13:5]. In another passage (Lev. 18:25) Ramban wrote that Rachel died outside of Eretz Yisrael, and then remanded his commentary. Finally, when the Ramban was in Akko, he discovered an ancient silver shekel coin. There was writing in ancient Hebrew script on both sides. With the help of the Samaritans, who were familiar with this script, the Ramban wrote that the words “Shekel of shekels” was written on one side, and “Holy Jerusalem” on the other. 300 years later, R’ Azarya de Rossi of Italy found a similar coin, and he wrote that it said “Shekel of Israel” instead of “Shekel of shekels.” According to the late Dr. Ya’akov Meshorer, the Samaritans confused a hey with a yud and a quf with a reish. Ofer thinks the Samaritans read it as Shekel Hashkal, which is why the Ramban was given inaccurate information. Jonathan is a student at Yeshiva College and takes classes at the Belz school.